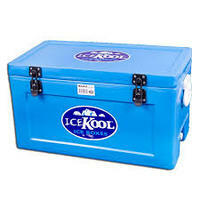 Designed in Australia.... for Australian conditions.... by an Australian company! 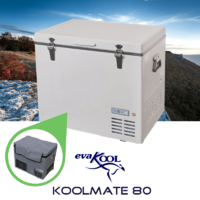 For over 30 years Evakool has been re-writing the rules for caravan refrigeration based on their own experience and valuable feedback from there ever-growing travelling customer base, who know what they need on the road and often in remote areas of the country. 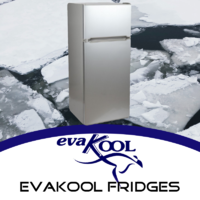 Reliability and simple ingenuity is evident through out the range of Evakool fridges. 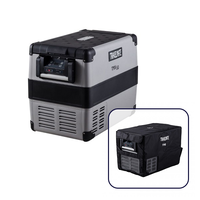 2) Heat dissipation is very important for optimal effeciency of your compressor. 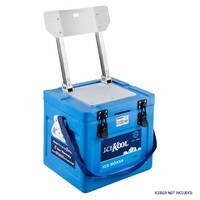 Evakool have a very spacious setup to allow effective ventilation. 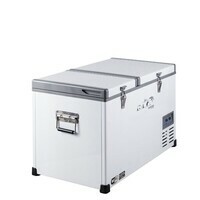 3) Cleverly designed vibration resistant mounting design helps with those inevitable bumps or corrugations in the road prolonging the life of your fridge. 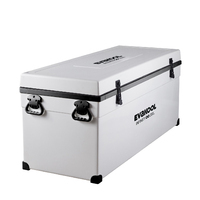 Regardless of some other big name brands like Waeco or Engel, that are currently on the market, Evakool are the pioneers for providing a caravan fridge that is reliable and robust enough to handle the varying climates Australia can throw at us. 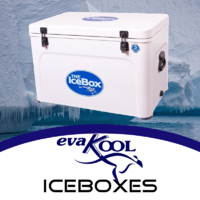 For Example, Evakool realise that Australian summers can regularly top 40+ degrees, you need good insulation to keep that cool air inside, and as a result Evakool have always included the best insulation for its purpose, this means you do not have a fridge designed for the cooler parts of Europe where the average temperature does not get over 30 degrees during summer, being distributed through Australia. 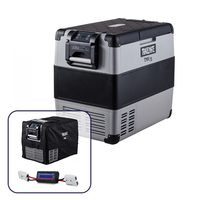 The added bonus of this beefed up insulation is that your fridge compressor does not have to work as hard to keep that fridge temperature cool saving your battery power and just as importantly the longevity of your compressor aswell. 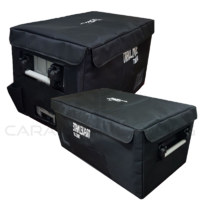 It is no point having a brand name compressor if it is not 100% suitable for your needs, this will cause premature wear and possibly failure short of its time if your compressor is working harder for longer extended periods. 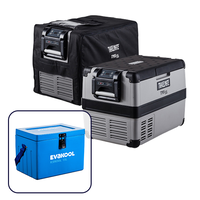 Evakool have designed their own compressor to perform reliably in Australian conditions. 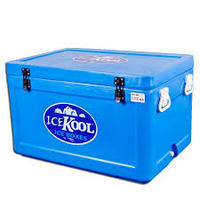 It is always a balance between amps drawn vs compressor output to have your fridge running in an efficient but reliable manner. If you can get this balance right as well as limit the start up drawing amps, you will find that it is not a matter of comparing to other compressors on the market, but making sure the compressor you have has enough grunt while tweaked for optimal running effeciency to make it 100% suitable for your needs - Evakool have nailed it with their well insulated design when taking Australian conditions into consideration. 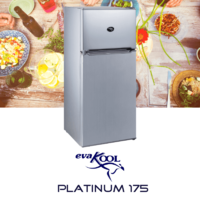 Sporting a satin platinum grey colour the surface is metal just like your fridge at home, allowing you to magnetically attach your favourite family photo of your loved ones back home. The interior is designed for easy access & cleaning with removable shelves & drawers as well as smooth interior walling & door panels. 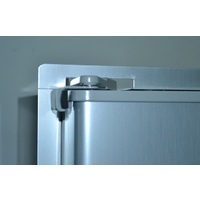 You can even remove the door panels and choose which side you want the hinges to be on. 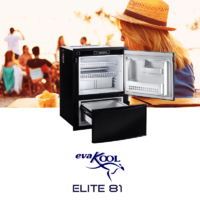 With internal temperature controls & LED lighting to help guide you to your late night snack, Evakool really have thought of everything. 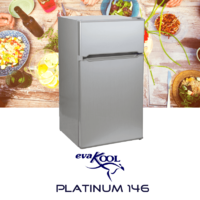 With all of these wonderful features it is easy to see why the Evakool Upright fridge freezer range is fast becoming Australia 1st choice for their caravan fridge. 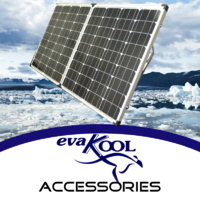 Backed by a 2 year No-Fuss warranty with Nation Wide service, you cant go wrong with Evakool. 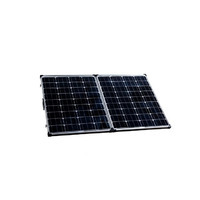 Call us today on 1800 RV Parts (1800 787 278) or click through to one of the models above for more information today.